The final performance of our Spring Texas Tour is coming up! One of our favorite pieces on the program is Stephen Goss’ “Park of Idols”. If you’ll be in the Dallas area on Friday 3/29, join us for an afternoon concert at Eastfield College. In spirit of the holiday, here is a folk song from neighboring Wales, which we performed back in February as part of Collin College’s annual guitar festival. We look forward to sharing this and more at our Groupmuse tonight! Looking back on our time spent in Nice, France last summer, spreading music around the warm and breezy French Alps. On this frigid Colorado morning, enjoy an excerpt of “…Before the Solstice…” set in a 1000 year old church. Those acoustics, though! Our recording of “Azur” is now available on Bandcamp! 'Azur' was commissioned from Tomàs Peire Serrate, and premiered in May 2017 in Denver, CO. Recorded At UCLA April, 2018 after a successful GoFundMe campaign. Mixed and Mastered by David Siu. 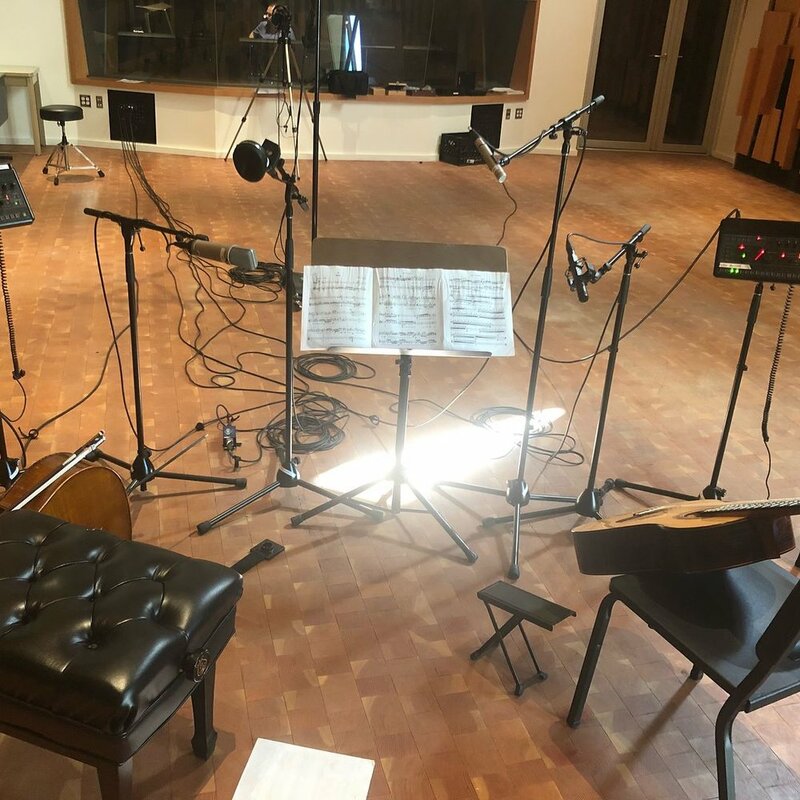 "The project of writing this suite for cello and guitar came after spending two weeks in a remote village in the French Alps, not far from the Côte d'Azur. It was an artistic and spiritual retreat for me, which gave me the opportunity to release some of the stress that I had accumulated living in a city like Los Angeles. In these three movements, I tried to bring back and enjoy different memories from those days; impressions of places, of moments, and emotions. All these are mixed and interfered with reminiscences of the tension that was dissipated at that time." We’re still coming down from a busy weekend of travel and performance, but our first trip to Texas was such a fantastic experience. Colorado didn’t want us to leave- it was so cold at DIA that the pumps to get fuel out of the ground froze- but we made to Texas in one piece. Big thanks to luthier Aaron Ringo for putting us up at the new WoodRing shop, and congrats on the new space! First concert at Tarrant County College NW was a ton of fun, and it was great to see some familiar faces, and meet so many new ones. Next up was the 7th Annual Collin College Guitar Festival. The Kithara Duo (Olga Amelkina-Vera & Fernand Vera) and Robby Gibson put on a fantastic concert the first night, and we followed them up the next day in the lovely Arts Gallery on campus. Next day we joined a masterclass with Robby, and worked with some guitarist and a violinist- some great stuff happening there. The festival wrapped up with our participation in the first reading of Olga’s new piece “The Road to Thalassus” for guitar orchestra, SSAA, and strings. Big thanks to Olga & Fernand for hosting us, and for a fantastic festival! And thanks to friends and family that made it out to support us. Remember that time we took LA by storm? We've been reminiscing on our time spent in Los Angeles this past April as we continue to work on the project we started there: recording our first commission, "Azur". Stay tuned for news on the recording, as well as videos from the concert we gave at UCLA while we were there! For a couple weeks this past July, we had the pleasure and honor of attending the Zodiac Music Festival and Academy as Ensemble in Residence.